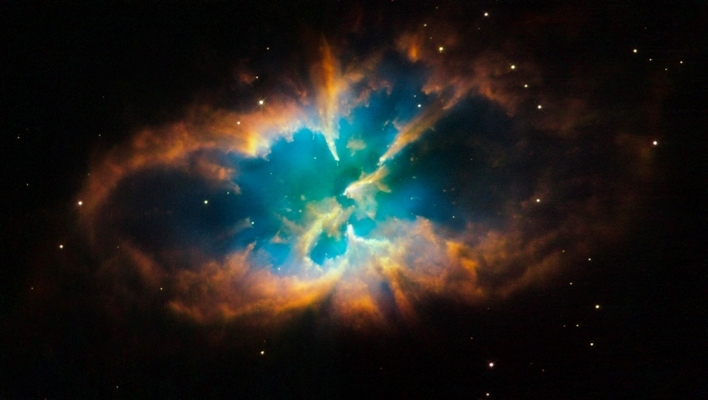 A planetary nebula designated NGC 2818, photographed by the Hubble Telescope. The first thing to notice about God’s story is that it begins with creation and it ends with a new creation. If nothing else, this suggests that creation is crucial to understanding who God is and what he is about. “In the beginning, God created the heavens and the earth” (Gen 1:1). Genesis 1 provides the cosmic overview. Everything that exists comes into being at God’s command. As we move into Genesis 2, the story focuses tightly on the details of the creation of mankind, the very first marriage, and the responsibilities entrusted to men and women. Everything is good. Everything is perfect. Everything is just as it should be. Then tragedy strikes. 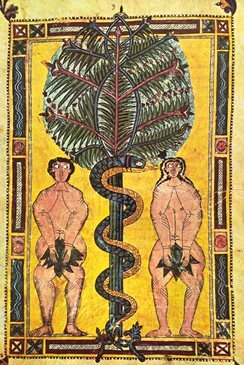 Incredibly, Adam and Eve rebel against the One who gave them paradise. In judgment and mercy, God thrusts them out of the perfection of his presence in the garden of Eden, into a created world that is now cursed and fallen. The Lord saw how great man’s wickedness on the earth had become, and that every inclination of the thoughts of his heart was only evil all the time. The Lord was grieved that he had made man on the earth, and his heart was filled with pain. So the Lord said, “I will wipe mankind, whom I have created, from the face of the earth—men and animals, and creatures that move along the ground, and birds of the air—for I am grieved that I have made them” (Gen 6:5-7). What follows these chilling words is the flood. 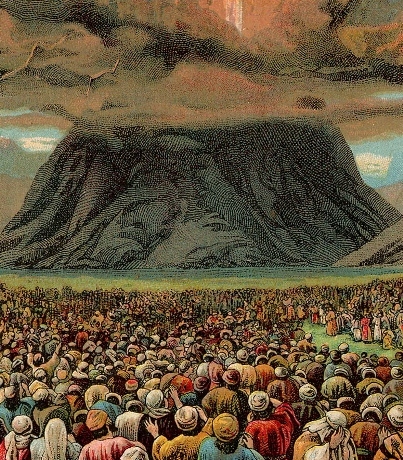 It’s judgment day for what Peter called “the world that then existed” (2 Peter 3:6, rsv). But it is also an act of re-creation, at least in part. Once again, the earth is formless and void, covered by the waters of the deep (cf. Gen. 1:2). What’s more, the earth is washed clean, as it were, of mankind’s sin. God now commissions Noah and his family just as he had commissioned Adam. Echoing Genesis 1, they are told to “Be fruitful and increase in number and fill the earth…Everything that lives and moves will be food for you. Just as I gave you the green plants, I now give you everything” (Gen 9:1-3). A new world—our present world—emerges as God once again put boundaries between the land and the sea. But though the world is externally cleansed and recreated, internally the hearts of men and women are not changed. Within a few short years, sin again tears Noah’s family apart. By Genesis 11, humanity’s prideful wickedness asserts itself once more, followed by another act of God’s merciful judgment: he confuses their language at Babel and scatters them across the face of the earth in order to slow the progress of their wickedness. At this incredibly low point in the story, with mankind not only alienated from God, but also permanently alienated from one another, God’s creating activity profoundly changes the course of human history. God speaks, and he creates, not a new world, but a new man. He takes the pagan idolater Abram and, by his irresistible call of love, changes his heart and his name. 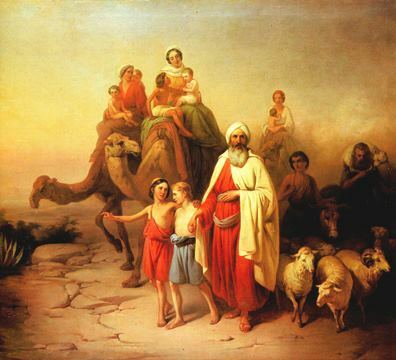 Abram becomes Abraham, the man who believed God and followed him. God then promises childless Abraham and his barren wife Sarah that he will make their family into a great nation. Then, according to God’s promise, not only do they conceive a son, but their grandson has twelve sons. Before long, you can’t even count all their descendants. From a single man and a single woman, they have multiplied and been fruitful and filled the land God has put them in. The story rushes on. This nation of Abraham’s descendants, Israel, is enslaved by another nation. And so God sends his prophet, Moses, to speak God’s words to Pharaoh. God speaks, Egypt is judged, and the nation of Israel is liberated. Then Moses went up to God, and the Lord called to him from the mountain and said, “This is what you are to say to the house of Jacob and what you are to tell the people of Israel: ‘You yourselves have seen what I did to Egypt, and how I carried you on eagles’ wings and brought you to myself. Now if you obey me fully and keep my covenant, then out of all nations you will be my treasured possession. Although the whole earth is mine, you will be for me a kingdom of priests and a holy nation.’ These are the words you are to speak to the Israelites”…And God spoke all these words: “I am the Lord your God, who brought you out of Egypt, out of the land of slavery. You shall have no other gods before me” (Ex 19:3-6, 20:1-3). God also promises to settle the people of Israel in a land flowing with milk and honey, a veritable garden of Eden, where former slaves can finally rest. Incredibly, the people rebel, not just once, but again and again (Ex 32; Num 11-14, 16, 21, 25). God judges the whole generation, letting them die in the desert, and then recreates the nation again with their children. He establishes them in their own land, the promised land of rest, and eventually raises up for them a great king, David, who gives them rest on every side from their enemies. But again, like the generations before them, like Adam and Eve at the beginning, the nation rebels. This leads first to division and finally to judgment and exile. Scattered among nations whose speech it does not understand, Israel has recapitulated in her own history the first eleven chapters of Genesis. But then, once again, God’s creating grace intervenes. A remnant of the nation is brought back from exile. The Temple is rebuilt and the walls of Jerusalem are restored (Ezra & Nehemiah). But something is missing. The Temple may be rebuilt, but it’s empty. God is not there. Jerusalem’s walls may be restored, but the throne of David is a shadow of its former glory, and soon sits vacant. 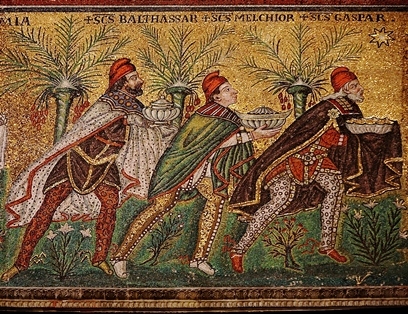 Byzantine depiction of the Three Magi in a 7th-century mosaic at Basilica of Sant’Apollinare Nuovo. In the beginning was the Word, and the Word was with God, and the Word was God. He was with God in the beginning. Through him all things were made; without him nothing was made that has been made. In him was life, and that life was the light of men….The Word became flesh and made his dwelling among us. We have seen his glory, the glory of the One and Only, who came from the Father, full of grace and truth (John 1:1-4, 14). That Word was Jesus, God Incarnate. In his life, he spoke and the blind could see and the deaf could hear. And though wicked men crucified and buried him, the creator who had life in himself could not be kept in the grave. 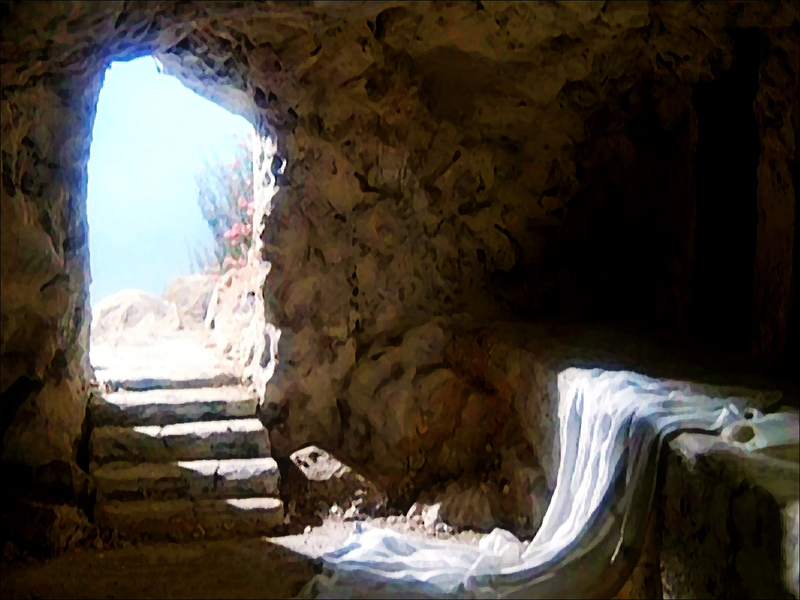 Jesus rose from the dead, and with his resurrection, inaugurated the New Creation, a work that continues today. Through his word, the gospel, Jesus resurrects dead sinners in newness of life and makes them new creatures (Eph 2:1-9). Through his word, the gospel, he calls his people into a new humanity, a holy nation, what the author to the Hebrews, echoing Exodus 19 and 20, calls the assembly and church of the firstborn (Heb 10:22-23). Then I saw a new heaven and a new earth, for the first heaven and the first earth had passed away, and there was no longer any sea. I saw the Holy City, the new Jerusalem, coming down out of heaven from God, prepared as a bride beautifully dressed for her husband. And I heard a loud voice from the throne saying, “Now the dwelling of God is with men, and he will live with them. They will be his people, and God himself will be with them and be their God. He will wipe every tear from their eyes. There will be no more death or mourning or crying or pain, for the old order of things has passed away.” He who was seated on the throne said, “I am making everything new!” Then he said, “Write this down, for these words are trustworthy and true” (Rev 21:1-5).